We are on a mini break in deepest darkest Wales (Pembrookshire) at the moment so have been eating out a few times. 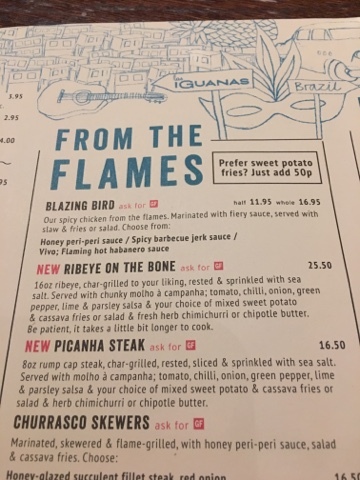 On the way down in Cribbs Causeway near Bristol were stopped off at a Las Iguanas for a change and spotted that the menu was very different to the last time we ate in our home one in Birmingham. 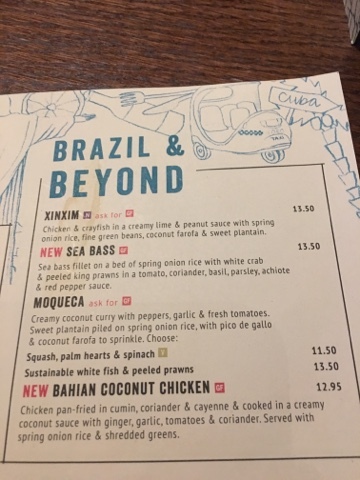 And this fantastic sounding Bahian (it's a region of Brazil) curry - which I will certainly go back and try. Today however I had the Picanha Steak. This wasn't quite what I had pictured, but it was certainly very appetising. 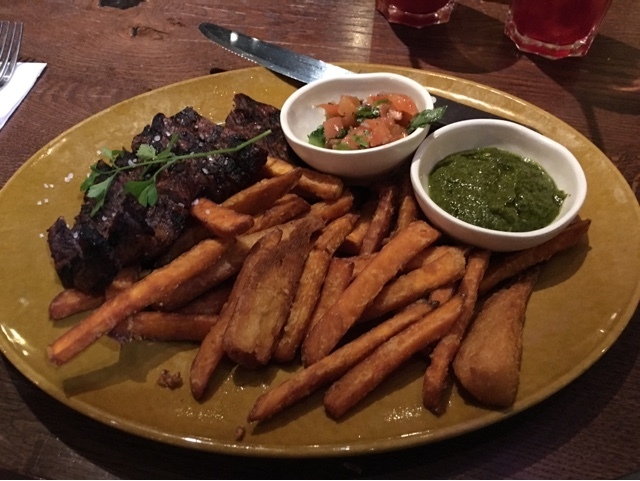 The plate was mostly sweet potato fries (a fashionable trend I can get behind) and the sauces were separate as if they may scare the more reserved diner. Despite all the wonderful descriptive text on the menu I'd ordered the safe choice - darn! The green sauce was basically minty pesto, and the chopped tomato was a simple enough garnish. The steak was nicely done but had none of the regional flair I'd hoped for. It tasted pretty English! When mixed together the flavours came alive and I did really enjoy the meal. It was certainly filling enough and well put together but with someone whose tastes are a little more conservative in mind. This does mean I could take my Granddad to Las Iguanas and he could have this while I go for something that sizzles and pops with flavour. Just means I definitely have to go back for the curry now!